The golf season at Cougar Creek begins mid April and goes to mid to late October. The hours of operation vary with the season and weather. Tee Times may be booked seven days in advance by calling 780-892-4545. If you are planning for a tournament or group you may book up to one year in advance. All Green Fees are in Canadian funds and include GST. Please review our Reservation and Cancellation Policy. If you are playing Cougar Creek for the first time, please take note of our Dress Code. 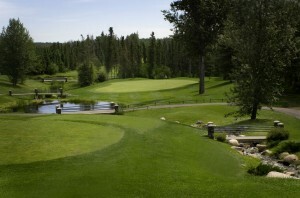 Cougar Creek Golf Resort is one of the finest golf facilities in the Edmonton area. It is nestled in a natural forest on rolling terrain. Each hole is generously spotted with sand bunkers and most are lined with trees and have water in play. All of this combines to make Cougar Creek a breath taking experience and is located only a short 30-minute drive west of the city near Stony Plain. Our facility offers a unique golf experience for all levels of players as multiple tees allow the course to be played from 5,200 yards to 6,900 yards. Cougar Creek Golf Resort offers the player several options. You can play as a Daily Green Fee Player, a Punch Card Pass Holder, a Season Pass Holder or a Corporate Pass Holder. Cougar Creek Golf Resort welcomes the opportunity to provide you with a tour of our facility and answer any questions that you have regarding our golf course information. Please feel free to call and talk to us at 780-892-4545. Advertise your business on our GPS screens. GPS Advertising is a unique and effective way to reach a large number of cliental and potential customers with minimal cost to you.  For as little as $0.05 per customer reached, you can have your ad viewed by everybody who plays Cougar Creek! For more information contact Jake at 780-892-4545 or click here for more information. Last minute cancellations are difficult to fill as the majority of golfers book in advance to play Cougar Creek. All tee times must be reserved by a credit card. Tee times may be cancelled up to 48 hours in advance without penalty. The full green fee will be charged to the customers who cancel within 48 hours, as well as for those who do not show. If cancelled times are filled, no fee will be charged. Weather changes quite often in Alberta, consequently we made provisions both in the design of the course with a continuous cart path and power carts with canopies and golf bag covers so the course may be played during inclement weather. A weather/rain cheque will be issued redeemable in the present golf season for either 9 or 18 holes depending on a player’s position.